While we know that all of British society was affected, often personally, by the Great War, some groups within society as a whole may have felt that impact more than others. Just how were students at the College affected? Certainly some lived in streets bombed by the zeppelin and bomber raids, and while none of the bombs were dropped on Dulwich, Ian Castle’s books in the Osprey series show that there were hits over South London where Dulwich boys lived. I have carefully looked at the Dulwich College War Record 1914-1919 in which McCulloch Christison tried to record a biography of all Old Alleynians who died. He was helped by Captain H. F. Hose, who commanded the Dulwich O.T.C. during the war, and who tried to keep an accurate record of those serving. Christison knew that his record was not complete, but he was sure that what was published was at least accurate. In particular, I have looked at members of the College sports teams who lost their lives, knowing the great effect that one death of a sports hero can have on a student. I have had to make some assumptions: that Christison is correct in his facts and, remembering him, I could hardly think otherwise; that 1st XV 1910 means for the 1910-1911 school year; and that 1st XI 1911 means for the 1910-1911 school year. 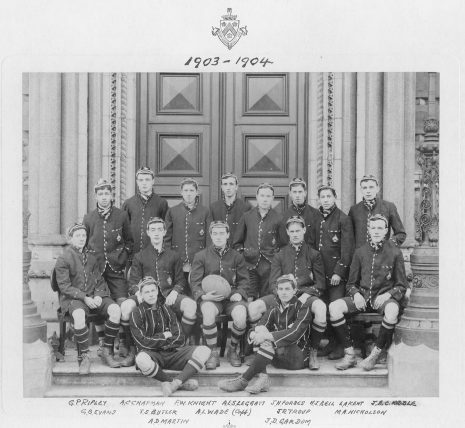 Every 1st XV from 1886 to 1916 lost at least one player, except for the 1889 and 1890 teams. The 1914 and 1915 teams each lost five players, the 1916 team lost four; and nine teams lost three (1893, 1894, 1897, 1898, 1899, 1900, 1905, 1907 and 1911). 41 players were killed – many had played for more than one year. Similar figures for the 2nd and 3rd XVs are not as accurate because they do not include players who would later play at a higher level, but the 1908, 1911 and 1915 2nd XVs each lost three players. The cricket teams were not as affected – there are of course 25% fewer players. All 1st XIs between 1887 and 1916 lost at least one player, except for 1888, 1889 and 1902. The 1893 and 1894 teams lost three, and the 1915 team lost four. 24 players were killed – again, many are counted on more than one year. 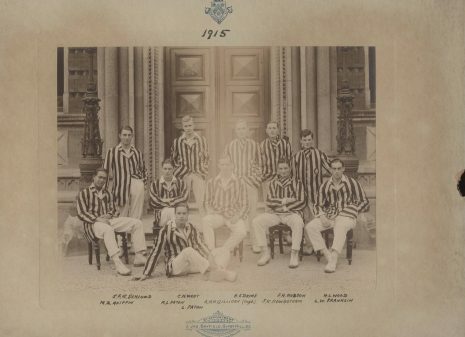 The 1903 2nd XI lost three players. I believe 13 past members of the Shooting VIII, and 9 past members of the Gymnastics VI also died. Others had been members of other minor sports teams. 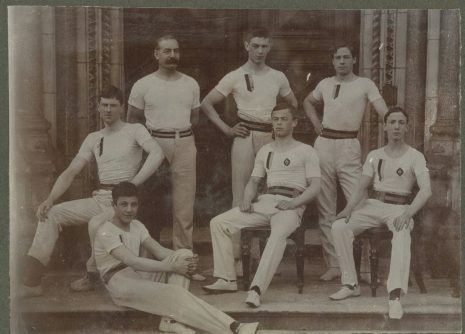 Photograph of the 1909 Gymnastics VI. The only one of the fallen pictured is H.G.W. Wood. Of note: 38 had passed out of Sandhurst, 17 from RMA Woolwich, 5 out of RNC Greenwich and 3 from HMS Britannia. Christison also noted that 372 members of the Old Alleynian Football Club served, with 76 being killed. To be noted also is that the Halahan family had six sons serving, two of whom were killed: Captain Henry Halahan on the Zeebrugge raid on April 23rd 1918, and Lt.-Commander Robert Halahan who died commanding submarine E 18 sometime after June 12th 1916. 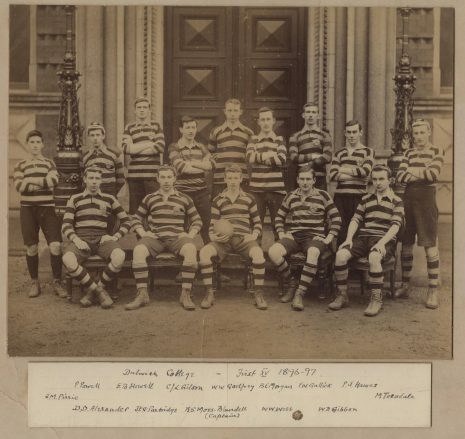 While each death would have had an effect on those who remembered the Alleynian, the overall effect as major sports teams began to be annihilated must have been very strong on those still at the College who looked around at their friends and wondered what fate lay ahead for each of them. © COPYRIGHT: DULWICH COLLEGE 2019. WEB DESIGN: PAD CREATIVE.